Synthesizer products available to buy now - posters, mugs and gifts. New synth poster to be unveiled at Synthfest! It will also available in white, and will be on sale on this website from October 7th 2018. Every fancied comparing the sound of every synth with the sound of every other? Yes, us too. And here it is! A growing compendium of over 300 synths from the first golden age of synths - 1960 - 1990. It will be expanded to include more recent synths and modular systems, drum machines and samplers in due course. I thought I'd write a quick blog post explaining more about the rationale for the selection of the synths. 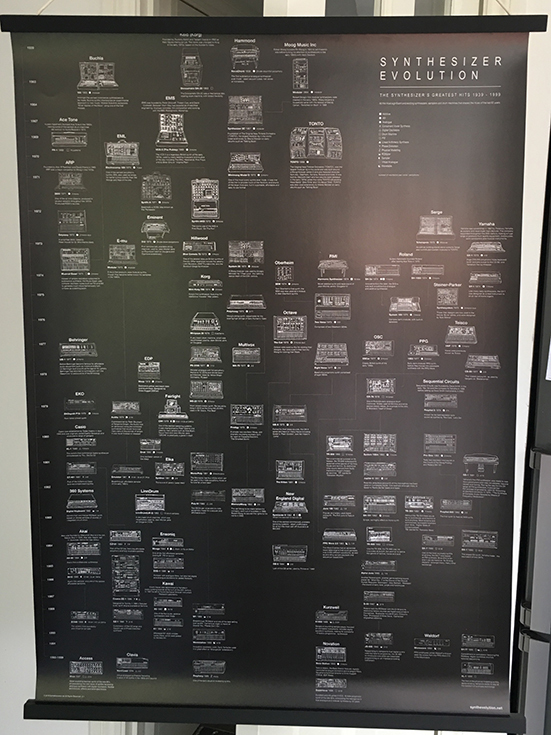 I've had some great conversations with customers about the poster and the reasons for stopping at 1995 and why some synths are on there and some aren't. The original concept was to celebrate analogue and modular synths - my first (real) synth was a Moog Prodigy and I immediately fell in love with the sound world. I already loved the electronic music of the time - Kraftwerk, Tangerine Dream, Vangelis, Jarre, Depeche Mode, Bilinski, et al - so that's not too big a surprise probably! But I've loved analogue synths and sounds ever since and it occurred to me that it would be great to have a poster charting the progress from massive individual transistor based modulars, through the 70s and 80s analogue golden age, right up to the point where modern chips could model analogue circuits in software. An amazing story and symbolic of technological progress in our era. So I started gathering data on all those synths, but I soon realised that I couldn't just do analogue. Partly because how purist should I be? Some synths with digital oscillators have analogue filters and are classics (eg, Alpha-Juno). Would seem a bit odd to exclude those. And some digital synths are truly great as well - PPG's wavetable synthesis, the additive synths (Kawai K3) and some of the weird and wonderful ones..
And could I really exclude the revolutionary sound of FM? A synth poster without the Yamaha DX7 would be absurd. So, I ended up including pretty much every major synth ever made during that era - which is nearly 300! But it was the ROMplers where it got tricky...it was important to have the early 'sample & synthesis' synths like D50, M1 and K1 on there, obviously, but it all gets a bit boring once you get to the Korg T1 and other run of the mill synths and workstations like that. Or rather - there are a lot of them, and that type of digital synth just doesn't excite me in the way analogue does. And I suspect that's true for a lot of synth fans! The other difficult area was where to stop. I decided to complete the story with the Korg Prophecy and Yamaha AN1x as they were the ground breaking original analogue-circuit modelling synths. I was tempted to carry on with Access Virus, Nord Lead, Supernova....but I had to stop somewhere, and that was all getting a bit modern and far away from the original concept. Given this is a synth poster, there are drum machines, samplers or FX units. Though it's a shame not to have Fairlight and Synclavier on there. I don't think there's a sheet of paper big enough to include those categories on there. I also excluded most rackmount synths as they're often simply keyless versions of keyboard synths, and to be honest - a bit boring to look at. Also part of the 'synth poster' rules was not to include electric organs, electric pianos, early pre-analogue electronic instruments. Most organs and pianos look very similar. And although early 'synthesizers' like the Trautonium, the Oramic Machine and the Birotron (invented by Dave Biro - true!) are fascinating, they are out of scope for this - I want VCOs, Filters, ADSRs and LFOs! I also mostly excluded synths with divide down architecture as they tended to be preset synths without 'synth-like' controls and again, tend not to be classics or that interesting. Same for string machines, though there are some honourable exceptions like the Eminent 310 used by Jarre for Equinoxe I and the preset Moog synth Polymoog used by Gary Numan on Cars. Another large category that I haven't covered are the Soviet synths - there are vast numbers of them and I would need a poster double the size to do them justice, but I've popped couple on there by Polivoks as a gesture. Finally, I'm aware that there are a number of quite obscure synths made by fairly obscure companies who produced a protoype or two and perhaps had a small commercial run or two, but have generally not included those, again on grounds of practicality of poster size, aesthetics and general familiarity. So, I hope that explains why a synth or two may be missing, but hopefully have justified that in some way. Always happy to hear about obscure synths or other favourites. I'm sure the Synth Evolution poster won't be my last...watch this space!